There are only a few differences between what the pattern calls for and what you need to make your own Sofia Princess Costume! I’ll show you what I did! Some sort of pom-poms to put in the bodice and on the sleeves. I got this by the yard from Joann’s (actually it’s all from Joann’s. This could be an add for Joann’s… It’s not though) I bought 2 yards but you might want at least three if you want to continue the skirt pom poms onto the back. White fabric- just enough to cut the skirt portion again. I used some old muslin fabric that I had hanging around. Emerson-Sofia Sleeves (which I have included for free as an add on to the Emerson! Just click on the the link.) You could also use the sleeve that comes with the Emerson pattern for a different look. It is a kids costume, it doesn’t have to be an exact replica! Purple Ribbon for the under skirt. The only thing that you will cut different from the pattern is the skirt. I decided to add 2″ (4″ total when it’s opened) so that skirt will have a bit more fullness. Then I also cut the skirt piece the same way again on the white fabric. Assemble the bodice in the same manner as the directions call for, omitting ruffle and using pom pom string instead. (I experimented a lot with the best way to sew on the pom pom strand and for me, I liked using the walking foot. Play around with scraps before you sew on your good fabric!) Once you have your main fabric bodice and your lining bodice assembled, gather the sleeve piece to fit the arm hole of the main fabric bodice. Baste it in place. Lay the lining bodice over top of the main fabric bodice and pin and sew as instructed in the pattern, being careful to keep the sleeve out of the neck stitching. Sewing the under arms is a little different than instructed. You will now treat the lining and main fabric piece as one. With right sides together, pin the sleeves and underarms and sew with 1/2″ seam allowance. This seam will be exposed. I chose to trim it down and zig zag over the edge as shown in the photo below. And here is what the top will look like from the front. Next, we are going to hem the arms. Sew a line 1/4″ from the edge. Use that line to fold in 1/4″ and sew again about 1/16″ away form the edge. To attach the pom pom string, I hand basted them to the right side of fabric with the pom pom part facing towards the bodice. Then I turned the basted part under, enclosing the raw edge and hand stitched around the opening to finish. For me, hand stitching was the easiest way. For you, you might like to do it on the machine. I love hand stitching, but I’ll get into that later. Now we are moving onto the skirt. First thing I did is arrange the pom pom string onto the skirt until it looked good and then pin it in place (making sure stop the top a little lower than 1/2″ so it doesn’t get caught in stitching when you sew the skirt to the bodice). Then I hand basted it to hold it in place and machine sewed it on with a straight stitch to finish. As I said, I didn’t have enough to finish the design around to the back, but if you want to put it on the back, make sure you account enough space for the bias placket. For the back of the skirt, create the bias bound placket as said in the instructions, the only difference is to layer the purple and the white and use them as one piece. When you sew the side seams of the skirt, sew the purple front to the purple back and the white front to the white back so that they will act as separate skirt pieces. Align the side seams and center notches and run the gathering stitches over both layers of fabric and then gather and sew to bodice, treating the bodice piece as one piece of fabric. You will have an exposed seam here. Again I trimmed the seam allowance and zig zag stitched the edge, then pressed the seam towards the bodice and top stitched it in place. Next, hem the bottom of the white skirt. Then hem the bottom of the purple skirt. Now on Sofia’s dress, there are scallops which are actually cut from the fabric however in this version, I took inspiration from that and used elastic to make gathered scallops. (I didn’t do the back, but I plan to finish the scallops onto the back before Halloween). First, mark how wide you want your scallops. This is sort of a guessing game. I choose to make mine 7″ out from the center on each side. And then, I cut 2 strips of elastic 4″ long. Really pull the elastic to make the fabric gather up nicely. You will see the fabric behind the presser foot gathering! 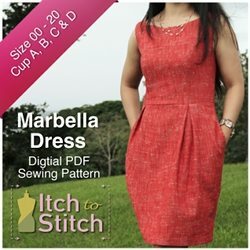 Starting at the side seam, pin the ribbon evenly around the dress, aligning or slightly overlapping the ribbon with the hem stitches. When you get back to where you started, overlap the edges and fold under a little tab of ribbon for a nice clean finish. Topstitch around top of ribbon and then topstitch around bottom edge of ribbon. I actually chose to hand sew this. Because I’m a handsewing addict. Seriously.